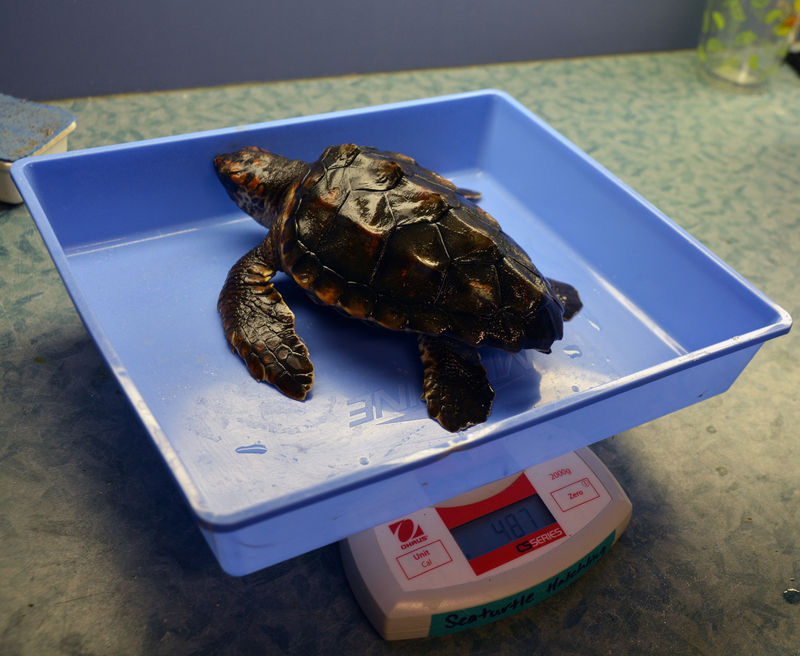 The loggerhead after her Jan. 13 weight check. After receiving the privilege of fostering a young hatchling loggerhead sea turtle via the North Carolina Sea Turtle Project and successfully transporting her back to Northern Kentucky in October, the Newport Aquarium husbandry staff has the task of ensuring that she develops healthy, strong and independent in order to increase her chances of survival in the wild. The first time Newport Aquarium biologist Jen Hazeres weighed the baby loggerhead on Oct. 27, the scale read 70 grams – the equivalent of one egg out of your refrigerator! Being so light made swimming for the loggerhead quite the challenge as she had to fight against her own buoyancy. This had potential to become problematic during feeding time as most of the young turtle’s food would sink to the bottom of her 90-gallon tank. The baby loggerhead eventually outgrew her 90-gallon tank. 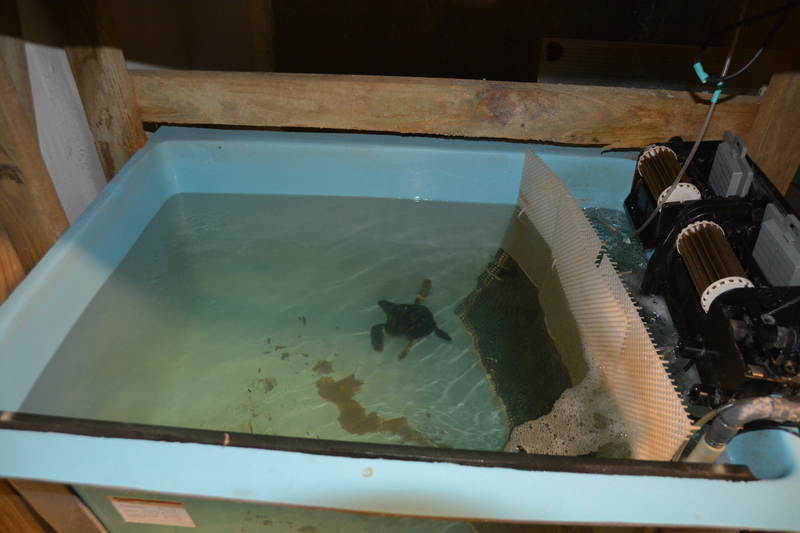 Hazeres, with assistance from fellow biologist Laurel Johnson, monitored the turtle’s progress during feedings. If she could not swim to the bottom of the tank to reach the food, hand feeding would be necessary. The fastest way for the loggerhead to combat buoyancy was to pack on added weight. Hazeres and Johnson have ensured she receives proper nutrients, feeding her twice a day. Her first meal usually consists of a gel concoction with added calcium. “It’s like a PowerBar for turtles,” said Hazeres. Her second meal in the afternoon is normally a meat, usually either fish or clam. 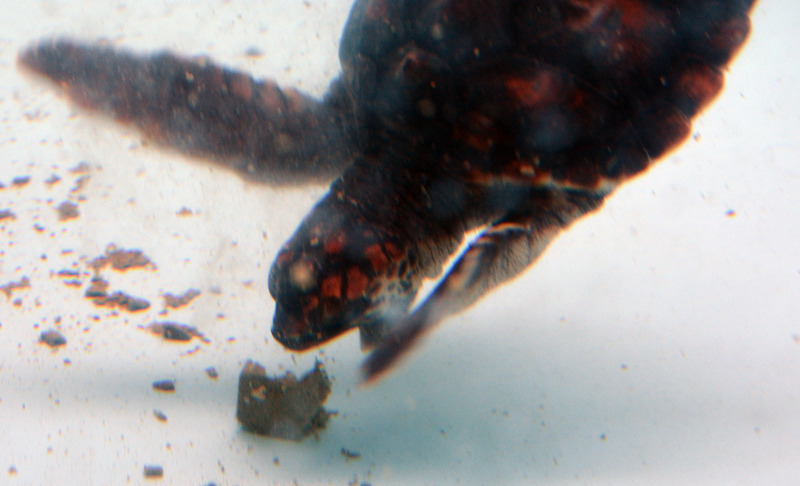 The baby loggerhead takes a bite of her morning meal. With this high protein diet, the loggerhead has seen an average growth increase of around 40 grams per week, or nearly half of her body weight compared to when she first arrived at Newport Aquarium. In just two months from her initial weigh-in here in the Northern Kentucky attraction, she went from 70 grams to 350 grams on Dec. 23 – a 400 percent increase! With the additional weight came increased muscle mass and improvement in her swimming, which made navigating to the bottom of her original tank for food a cinch. The loggerhead surpassed one full pound on Jan. 6 after weighing in at 487 grams and on the following day she was moved into a larger, 250-gallon tank. Her most recently recorded weight taken on Jan. 13 was 528 grams (1 pound, 3 ounces). 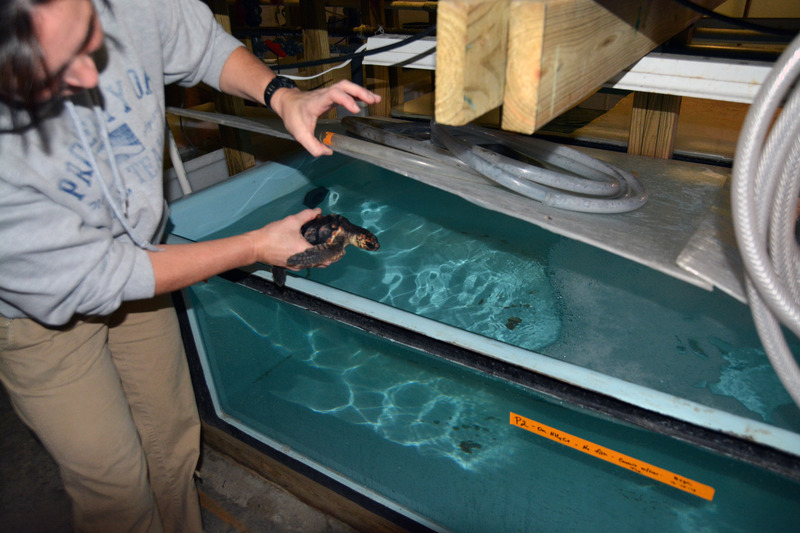 The baby loggerhead moved to her new 250-gallon tank on Jan. 7. She still has plenty of room to grow as adult loggerheads from the southeastern United States have an average weight of 250 pounds. 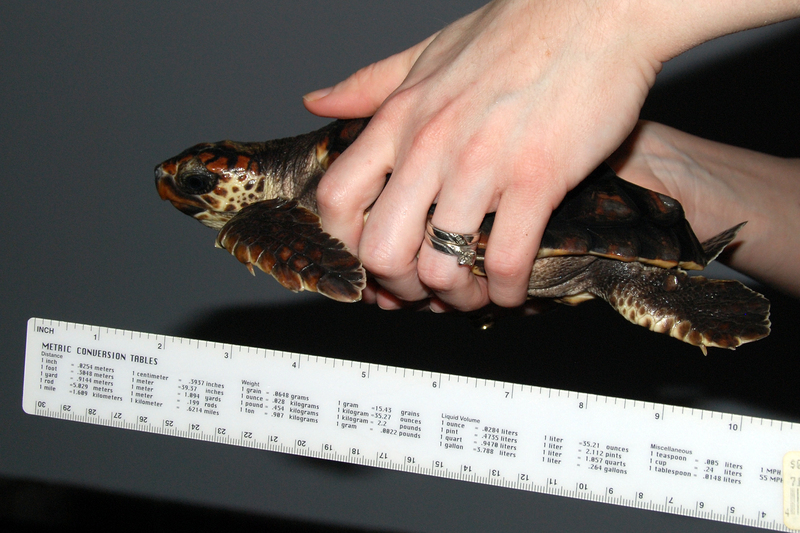 From the top of her head to the end of her shell, the baby loggerhead measured roughly eight inches long on Jan. 14. To give you a perspective, Newport Aquarium’s famed Denver, the loggerhead sea turtle who can be found in the Surrounded by Sharks exhibit, weighs 200 pounds. Denver the 200-pound loggerhead sea turtle. 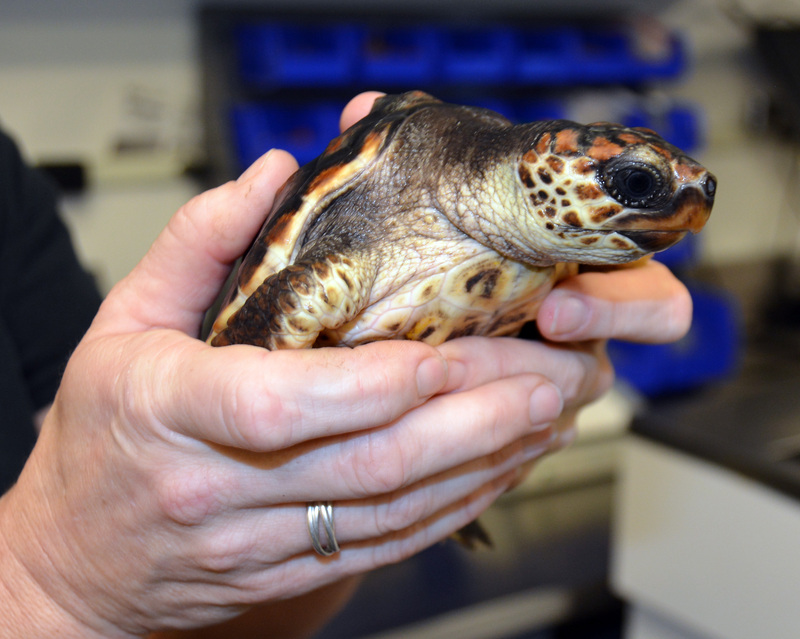 Visit Newport Aquarium’s official blog – aquariumworks.org – to read updates on the baby sea turtle’s progress. This entry was posted in Uncategorized and tagged turtles by NewportAquarium. Bookmark the permalink.